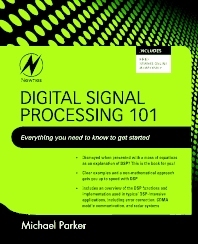 Digital Signal Processing 101: Everything You Need to Know to Get Started provides a basic tutorial on digital signal processing (DSP). Beginning with discussions of numerical representation and complex numbers and exponentials, it goes on to explain difficult concepts such as sampling, aliasing, imaginary numbers, and frequency response. It does so using easy-to-understand examples and a minimum of mathematics. In addition, there is an overview of the DSP functions and implementation used in several DSP-intensive fields or applications, from error correction to CDMA mobile communication to airborne radar systems. This book is intended for those who have absolutely no previous experience with DSP, but are comfortable with high-school-level math skills. It is also for those who work in or provide components for industries that are made possible by DSP. Sample industries include wireless mobile phone and infrastructure equipment, broadcast and cable video, DSL modems, satellite communications, medical imaging, audio, radar, sonar, surveillance, and electrical motor control. Dismayed when presented with a mass of equations as an explanation of DSP? This is the book for you! Michael Parker is responsible for Intel’s FPGA division digital signal processing (DSP) product planning. This includes Variable Precision FPGA silicon architecture for DSP applications, DSP tool development, floating point tools, IP and video IP. He joined Altera (now Intel) in January 2007, and has over 20 years of previous DSP engineering design experience with companies such as Alvarion, Soma Networks, Avalcom, TCSI, Stanford Telecom and several startup companies. He holds an MSEE from Santa Clara University, and BSEE from Rensselaer Polytechnic Institute.